Things haven't exactly been going super well for me lately. I won't be enlightening you with the nitty gritty at the moment, but let's just say that I've seen better days. Despite the gloom I've been experiencing, I've been trying really hard to stay upbeat. REALLY hard. It's not always easy to stay positive when you'd rather be lounging on the couch, watching television all day instead of going to work and putting on a happy face for the masses. Yesterday was 12/12/12 and it seemed like everyone was in a frenzy over it. So, my boss bought some scratchers and we got some SuperLotto tickets, too. My boss was a little more lucky than I was and won $500. When I checked my lotto ticket this morning I saw that I won $11 on a quick pick! Not quite the $19 million jackpot I was hoping for, but I'll take it! Another high note for me this week was going to Christmas in the Park with a friend of mine. Christmas in the Park has been a tradition in downtown San Jose for over 30 years and I happen to know the current President of the committee, so I had to make sure I went to see how it all turned out. This was only my second time going and it was fun to just walk around, see the animated displays that were set up, and get my mind off of things for awhile. Along with trying to keep a smile on my face, I'm also trying to get back into the Christmas spirit, and this was just what I needed. 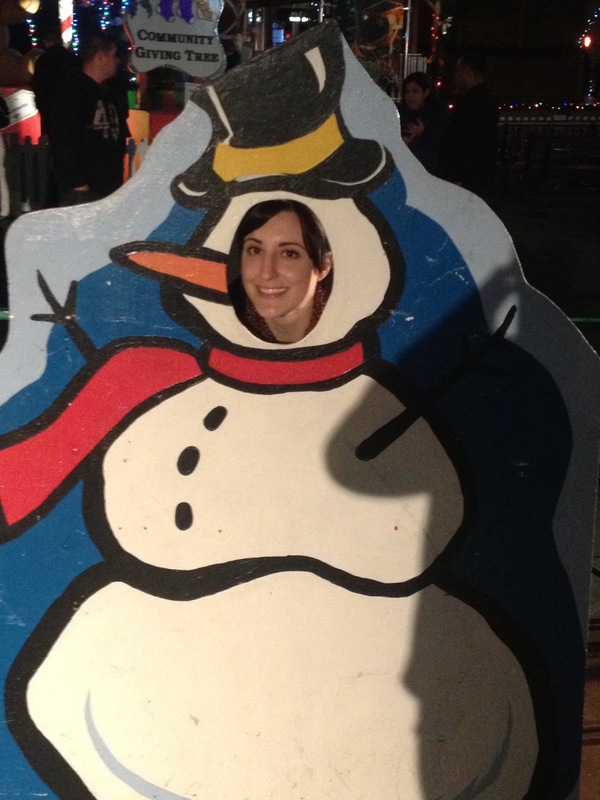 I mean, I was even willing to stick my face in the fat snowman cut out! I figured that was a better option than the Christmas tree. Besides, who wouldn't want a carrot for a nose?